When people think about special education, they typically don’t think about “company culture.” In fact, many folks run from the idea of creating a subculture within a school community for fear of not being inclusive. But don’t kid yourself — a culture is still created when nothing is done. What’s the problem with doing nothing? You’re at the whim of what’s created in a vacuum. And what you get isn’t always what you want. A school district can have the best mission statement, leadership team, workforce, intentions, outreach, timelines, paperwork, systems, and resources and still blow it in the realm of culture. And here’s the irony, culture trumps everything. Yes, EVERYTHING. What good are all those other efforts if no one is motivated to apply their best skills? Or worse yet, choose not to even stick around? If they care about kids, special education programs should strive to put culture first. It begins with Staff Recognition. It’s that easy. And yet, I observe countless folks getting it wrong. So in this post, let’s talk about what staff recognition is not. #1. Staff recognition is not generic. Giving everyone the same certificate of appreciation is easy. But it’s also insulting. I remember my frustration when I was working for a school district and working like mad to meet census deadlines only to receive the same generic blue certificate of appreciation as my colleagues who didn’t meet their deadlines. My takeaway? Why work so hard if it didn’t really matter to my boss? Mediocrity is acceptable. And sure, I’ll always strive to do my best professionally . . . so now I just feel taken for granted. In our efforts to not exclude anyone, leaders undermine their own efforts to say thank you. #2. 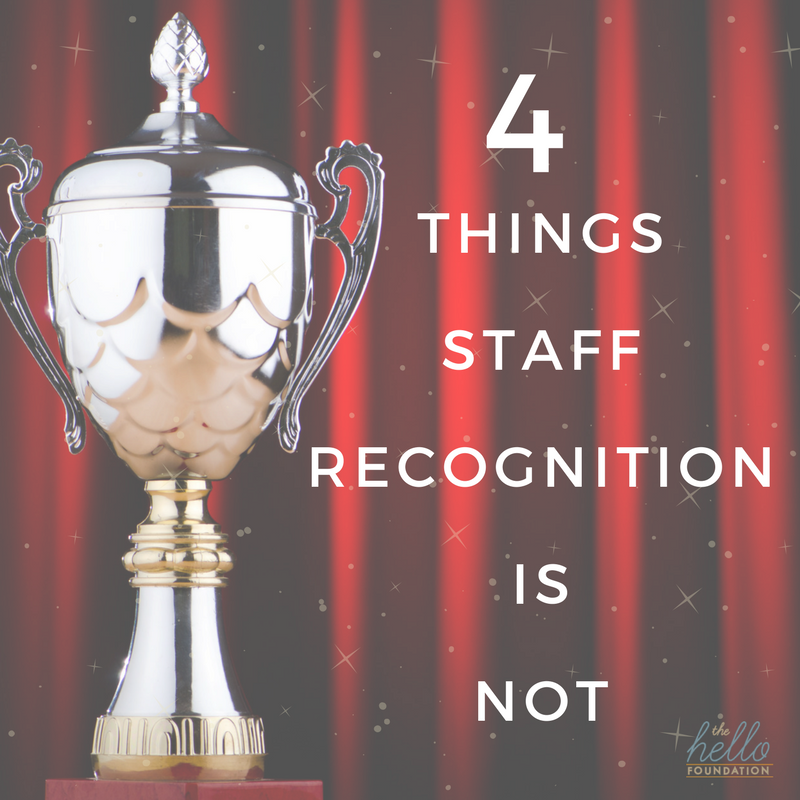 Staff recognition is not one-size fits all. Some leaders want to recognize staff, and hey, who doesn’t love a $5 gift card? After all, you have to make the effort to get a gift card AND likely, spend your own money! School districts don’t pay for that. Well, truth be told, there are lots of people for whom your $5 gift doesn’t mean anything, despite your best intentions. Maybe they don’t drink coffee. Maybe they feel it’s out of touch with the task for which they are being recognized. Maybe what they crave is a personal note indicating their boss really gets what they’re working to do. One person’s reward is another person’s meaningless trinket. #3. Staff recognition is not delayed. What gets acknowledged, gets repeated. If you tell someone you value their work on problem-solving tough situations with grace, they will likely be graceful the next time confronted with a tough situation. If you tell someone you value their positive attitude mentoring other professionals, you’re going to see continued mentoring and collaboration. So if you want to see something continue, reinforce it right away. End-of-the-year parties are great, but waiting to recognize someone decreases the likelihood of seeing it consistently throughout the year. If it’s worth a thank you, it’s worth saying right away. #4. Staff recognition is not expensive. At the heart of it, staff recognition is saying thank you. Yes, you can spend lots of money on flowers, food gifts, small tokens for everyone for different reasons, but that’s not really necessary. Many staff would love a simple note detailing why their boss values them. Our company culture rocks in part because of the simple things we do to recognize our staff on a consistent basis. Personal notes, public praise, relating someone’s specific efforts to our core values, acknowledgment in our internal newsletter, and periodic phone calls to validate their frustrations, fears, or success has paid off in dividends. Because I care about kids, my #1 priority is my staff. And this is a perfect time to say thank you to such an amazing and professional staff. Yes, a bit of a generic shout-out because I’m addressing them all but in reality, I want to work with every one of them for years to come. They care about kids, and I care about them.